The choice of PU leather holders is multiple, whether in color or size. 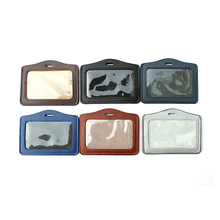 The PU leather holders is one of our hot sell products, it is popular among companies. 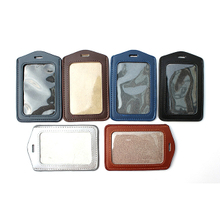 Except the color is multiply, we also provide with horizontal and vertical PU leather ID holders for customers to choose from. 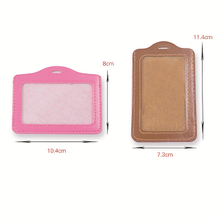 PU leather holders have wide usages, can be used for baggage tag, student card, office ID, IC card, credit card and so on. The transparent plastic part is medium in thickness and will make your PU leather holder looks high quality. Although the PU leather material is not better than cow leather, but for ID holders, the PU leather is enough and it is wearable and hard to peel. 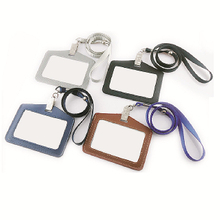 In order to make the use of PU leather ID holders beautiful and generous, we also provide various custom lanyards, you can select appropriate one to match. For more details, you can contact us at any time.